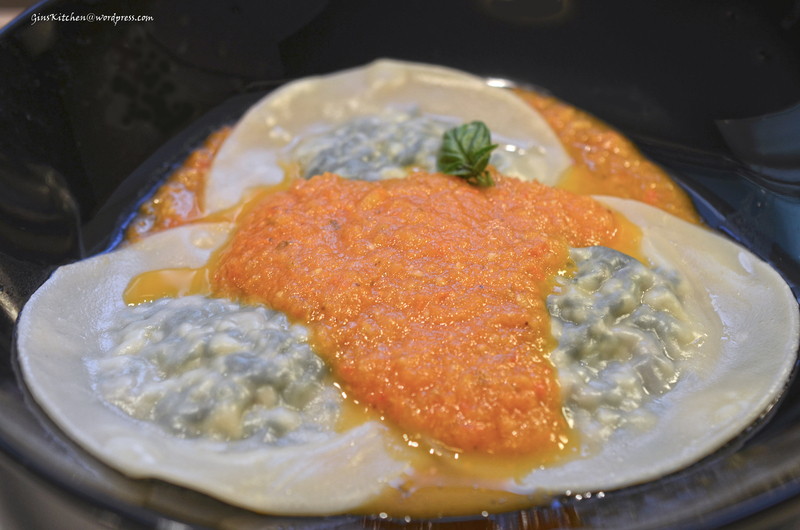 Making ravioli with wonton wrappers?!! I got this great idea when I watched Giada De Laurentiis’ Everyday Italian show. 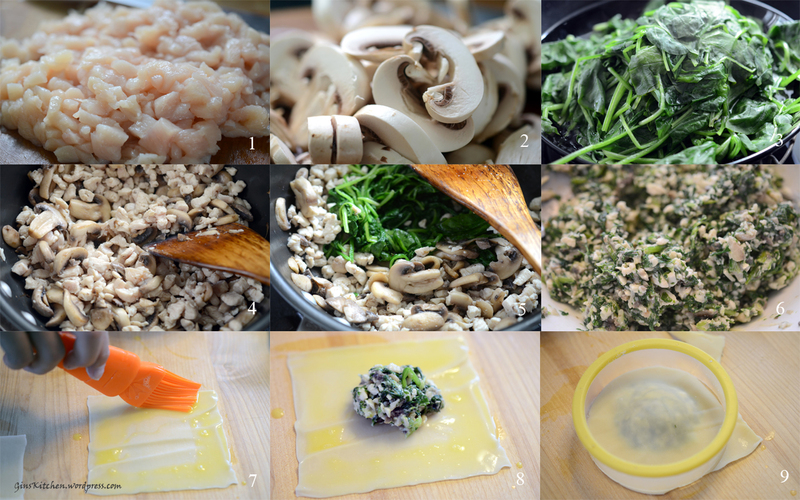 I did not follow her recipe 100% but if you are interested in her Spinach and Mushroom ravioli recipe, it is on the food network website. I changed the recipe quite a bit by adding chicken, using fresh spinach and making homemade pasta sauce. I like to make pasta sauce without using any canned tomatoes or tomato sauce, it’s much healthier and taste really fresh. Most of my pasta sauce is tomato based with basil and garlic. Instead of using Mascarpone (couldn’t find any at the store), I mixed cream cheese, sour cream and heavy whipping cream and added it into the filling. My 9-year old daughter helped me make the ravioli with wonton wrappers, this is something that little kids can do without ruining your dish! * If you plan to make my pasta sauce, it’s better to start with the sauce first as it takes 45-60 minutes to bake the tomatoes and garlic. In a large skillet heat 2 tablespoons of olive oil. When it’s hot, add the mushrooms and season with ¼ teaspoon of salt and 1/8 teaspoon of pepper. Cook until all the liquid has evaporated from the mushrooms, add chicken meat and stir fry until chicken meat is cooked (Pic 4). Add spinach and cook for 2 minutes (don’t worry about mixing all ingredients well as we will use a food processor to pulse the mixture). Taste the mixture, add salt if necessary (Pic 5). Place mixture into the bowl of a food processor, pulse until you get a coarse texture. In a bowl, combine cream cheese, heavy whipping cream and sour cream together. Mix well. In a large pot, bring to a boil 4 quarts of salted and oiled water. Carefully add small batches of ravioli, about 4 at a time. Cook for 5 minutes. 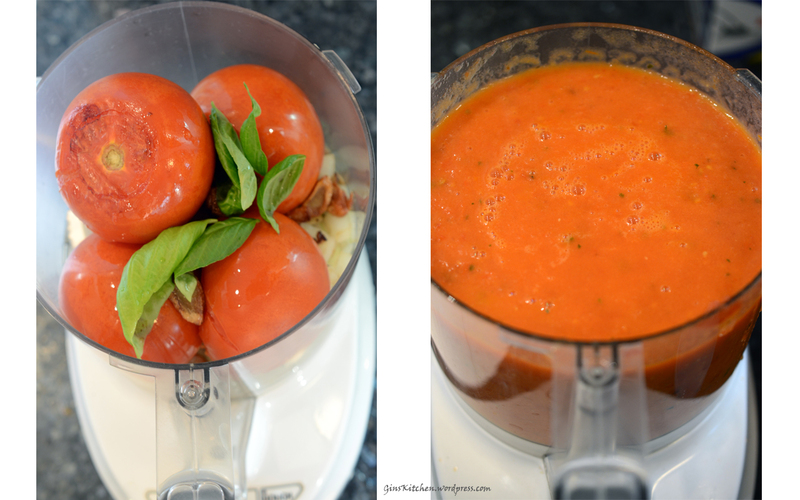 I have tried using cherry tomatoes for the sauce and the flavor is a huge difference. Cherry tomatoes are sweeter and will give the sauce a richer taste. Usually they are more expensive and you will need several packs to make the sauce. If you cannot find any on sale, roma tomatoes are just fine. I added shiitake mushrooms and onion to make the sauce a little thicker this time. Prehead oven to 350 F.
Place peeled garlic in a heat-resistant container and add olive oil (enough to fully cover all the garlic cloves). 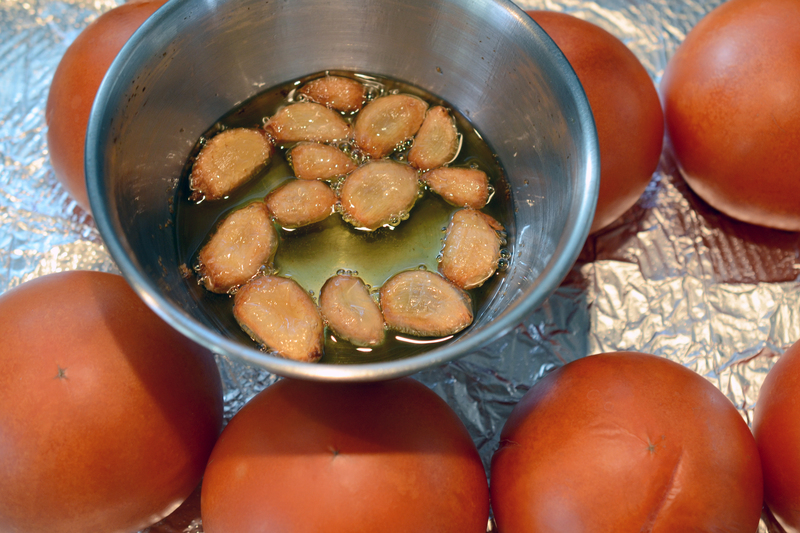 Bake tomatoes and garlic for an hour, you will see garlic cloves will turn brown (if cherry tomatoes are used, reduce the baking time). In a large skillet, brown onion and add shiitake mushrooms, cook for 5 minutes. Puree tomatoes, roasted garlic, basil, onion and shiitake musrhoom in a food processor, add 2 teaspoons of salt, a pinch of pepper and 5 tablespoons of the olive oil that we used to bake the garlic. You may want to add a tablespoon of brown sugar if tomatoes are not ripe enough. Spoon a little sauce in the bottom of the serving dish first (this keeps the ravioli from sticking to the plate), then add the ravioli with more sauce on top. Sprinkle Parmesan cheese on top. The pasta sauce can be stored in the freezer up to 3 months.